I just got this great wine chiller with aerator from Kitchen Ezentials. This thing works great. I often will have wine when we are entertaining but it might set out for awhile and I hate that it goes flat or becomes warm. So I love this wine chiller. It’s really easy to use and well-made. Simply put the stainless steel tube into the freezer for about two hours so that it gets really cold, screw it into the aerator and then put it into the bottle of wine. It keeps the wine cold for about an hour which is great cause usually when we are entertaining its for dinner so we don’t really need much more then an hour. The aerator is great because it keeps it’s from being flat even if it has been sitting for awhile. It has a great top on it that keeps the wine safe from air exposure. This is a must have for entertaining and wine lovers! 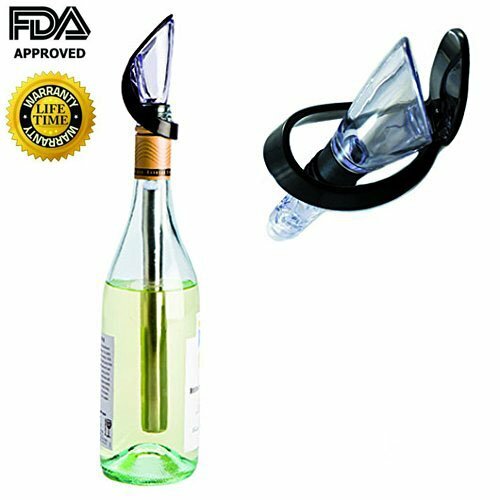 SINGLE BOTTLE WINE CHILLER STICK 4 in 1- This versatile product is the ONLY wine chiller stick you’ll ever need to keep your wine chilled, aerated for maximum flavor as well as enjoy a perfect pour every time. Perfect to chill red/white/ice wine & champagne. Plus, the self-closing lid means you can stop worrying about nasty bugs getting into the bottle when you’re sipping a glass of wine beneath the stars on a balmy summer’s evening. MESS-FREE ICELESS WINE CHILLER – No more fumbling with ice cubes while water runs down your fingers and all over your table. Your Kitchen Ezentials gives you the pleasure of crisp, chilled wine without the mess! Perfect table wine chiller! Great gift item for wine enthusiast, friends, families and your loved ones. ELEGANT STAINLESS STEEL DESIGN – Crafted from high-quality Type 4 stainless steel and BPA-free plastic, your Kitchen Ezentials 4-in-1 wine chiller stick is an elegant addition to your next dinner party, beach, camping, picnic or wherever you decide to enjoy a crisp, refreshing bottle of wine. A BREEZE TO USE – You’ll marvel at how easy your Kitchen Ezentials 4-in-1 iceless wine chiller stick is to use. Simply store the detachable stainless steel chilling rod in your freezer for 2 hours. Pour out some wine to make room for the chiller. Then, reattach the chilling rod to the pouring spout and insert into your bottle of wine. Voila! You now have a bottle of wine that stays deliciously chilled for up to an hour! Hassle free. Hand wash. Satisfaction Guaranteed. SINGLE BOTTLE WINE CHILLER – perfect for both White Wine, Champagne and Red Wine Chilling.